Keep Your Home Cool Giveaway is sponsored by DAP Products. I have been provided with product. All ideas and opinions are my own. This post contains some affiliate links for your convenience. Click here to read my full disclosure policy. It’s that time of year football, pumpkins, beautiful fall leaves and huge temperature fluctuations. 🙂 Is it going to be 100 deg or 50 deg??? You never know. It is a perfect time for getting outside and sealing up your home and keeping the cool air in…and in the winter, keeping the cool air out. 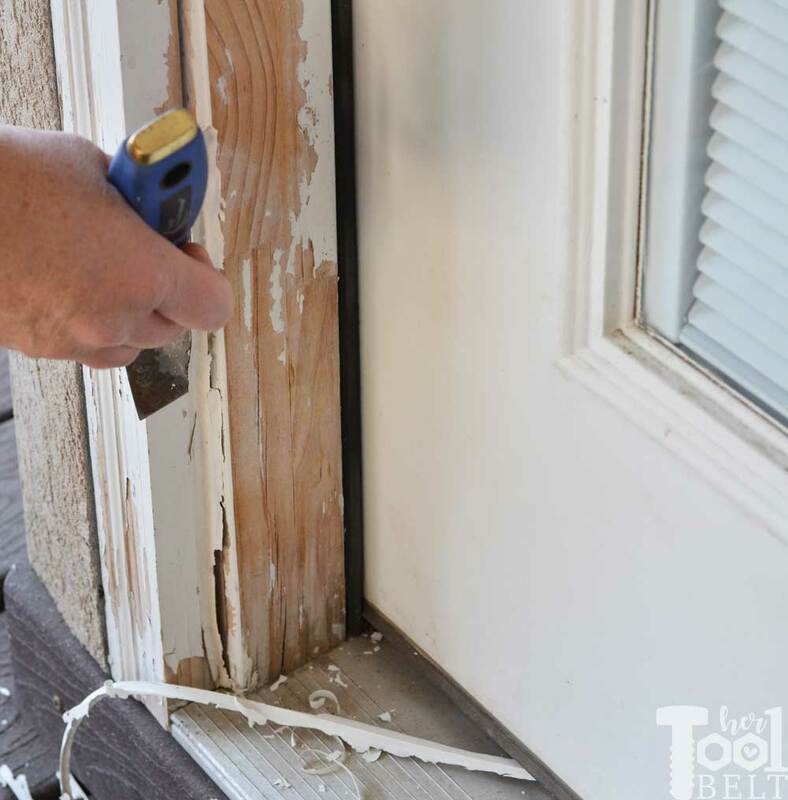 It’s a good idea to inspect around your windows and doors for weathered and cracking paint and caulking. Make sure to look especially close at those areas that are exposed to a lot of sun and water. I have a bad spot at the bottom of my back door with some major cracking. Time to scrape and remove that old caulking and paint. It’s not a hard job, just takes some time and patience. If you have a lot of area to scrape, it can be helpful to use a power scraper like an oscillating tool and scraper attachment. Once the old caulking and paint is removed as much as reasonably possible, it’s time to re-caulk and fill the gaps. 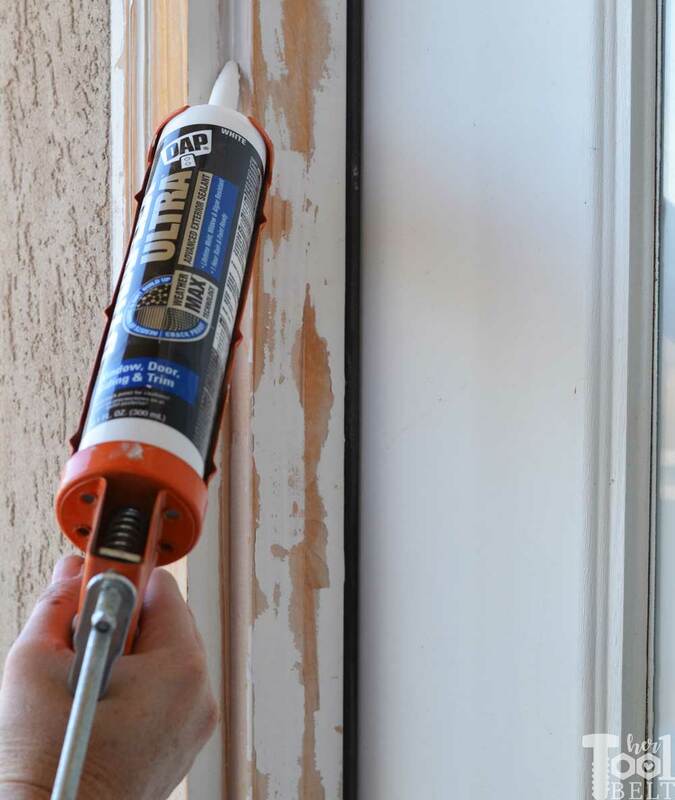 For the exterior projects, use a sealant/caulking that is waterproof. When applying caulking, I find I have the most control if I slice the tube tip at an angle and only have a smallish opening. Also if your sealant automatically comes out, release the silver tab on the back of the gun and that should help. Apply the caulking in the joint in a smooth motion, if you need to smooth it out, the index finger works well. Once the sealant is dry, it’s time to prime then paint the trim if needed. 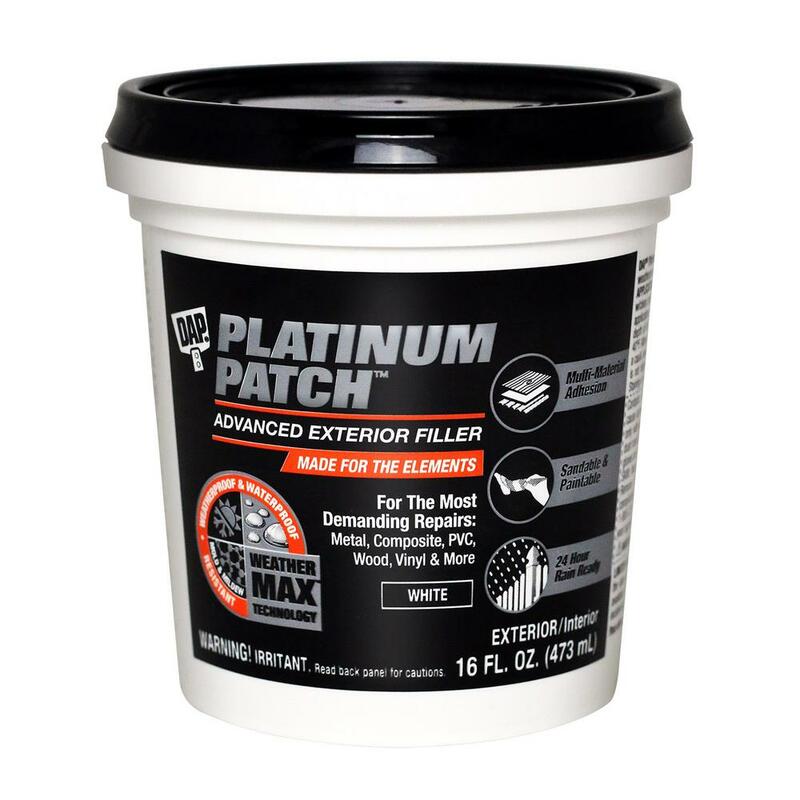 If any of your home exterior needs to be filled, DAP has a patch for that! Platinum patch can easily be applied with a spatula. It can be used on a variety of surfaces like: metal, composite, PVC, fiber cement, wood, mortar, concrete, vinyl, brick, stucco, plaster and drywall. DAP wants to help you keep your home cool this Fall. They are giving away a prize pack including DAP Platinum Patch, DAP Dynaflex Ultra and a Stainless Steel Cooler! Use the rafflecopter widget below to enter. The giveaway end October 6, 2018. Great timing as I was contemplating caulking a door this weekend. I’ll have to give DAP a try! We want to paint the floor in our garage. Need to caulk up those gaps for winter, there are few, DAP is a brand I always use. My main DIY project right now is to get some shelving put up in the garage. I am in the process of remodeling my master bathroom. My home was built in 1978 and I love updating it to the new styles ad trends and of 2018. To repaint some of the rooms. I am not really into DIY projects, but my mom is. I will be preparing my home for winter by putting up plastic and weather strips, etc. We must purchased our first home in May. Right now we are trying to add storage to the basement and garage. 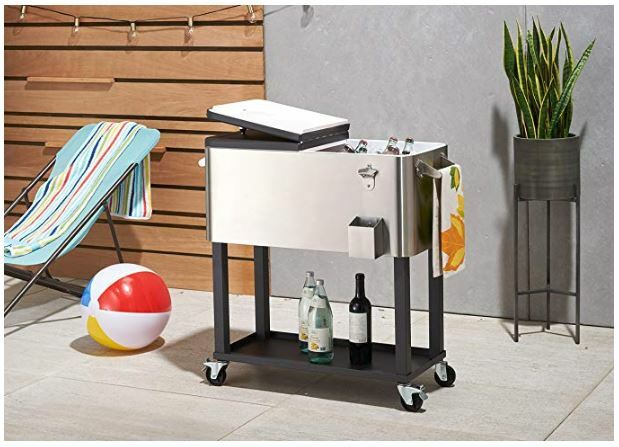 I want to fix our garage door and build an outdoor sink area. I am currently replacing the bathroom fixtures in our master bath. Then I want to hang shelves in the guest bath. I plan to remove and replace my blinds with Roman shades. I need something different and I believe shades are better for room darkening and keeping in warm air in the winter time. This is a project I believe I can handle best without bugging my husband too much besides I have a pink set of tools that I have been waiting to use. TO start paint the house inside, take ugly mirror down that is embedded into the wall, refinish all hardwood floors, and fix leaky pipe. We’re building a house so we have a lot on our to-do list! Our daughter and her husband are going to move into our current home, my husband needs to fix under the leaky kitchen sink before they move in. I am currently finishing up the backsplash in my kids bathroom but next I want to do a full length mirror for my daughters room and a topiary for the living room! I have to build s desktop and I want to turn a front hall closet into a mudroom of sorts. 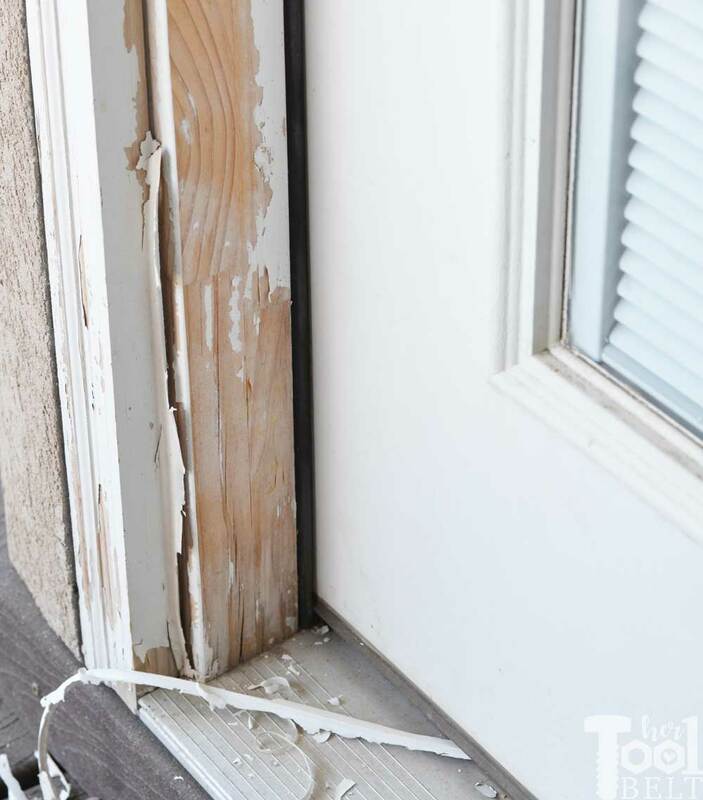 With winter coming I have to re-caulk the windows, I also have to check the basement windows and doors to make sure heat is not escaping and take care of that as well. Check around the doors for drafty areas and the roof to make sure no leaky spots. I have a saltbox style so snow accumulates on the front part and we have had a couple leaks this past year unfortunately so we are working on patching the metal roof we have. The only good thing is when the sun heats it up on warmer days the snow and ice slide right off. We are trying to finish are bathroom. Unrelated to DAP, we are going to pull up the carpet in our kid’s rooms and put down vinyl plank. I am currently working on a home movie theater. I recently purchased a projector and a “”120” screen but now I have to assemble the theater seating and lighting. I now want to make tea cup bird feeders for my feathered friends after watching one of your DAP DIY video’s today. They are so cute and would make a great tea cup garden for them. Thanks for sharing it with your Facebook followers. We need to refinish the down stairs bathroom.. again.. ugh! Right now we are expanding our driveway. We need to fix our deck. We just moved into our house in August and now we need to patch & paint the spare room! I want to redo my entire kitchen, floors, walls, all of it. Redoing doors and windows on our home. I have a big to do list this year! We need to replace our toilet in a bathroom, patch drywall holes in some walls, and there is definitely some caulking I need to do around drains, and seals in the house! I am needing to paint all the ceilings in the house and the bathrooms need and overhaul! I need to remodel my bathroom. I have a leak in my bathroom that I am working on as we speak. We plan on fixing up the garage, there’s a lot of things that needs to be done. Lots of backyard projects, like a shed! We are wanting to etch our glass dining room table…And add a deck..
We are doing our bathroom over this would be very helpful.. Some electrical work and then on to the roof. I’d like to help my Mom put up shelving and other organizational tweaks in the garage. Bathroom remodel, garage needs to be emptied into new shed, and have the snow blower prepped! We have a few going on right now. We are replacing both toilets, bathroom window and a hallway door trim. We are currently fixing old floors then doing an expansion on back, a partial basement with a storm shelter…Later, we will be doing the kitchen floors. I need to re-calk and fill gaps, as well as paint a bedroom. I am in the process of remodeling the basement bathroom right now.